If Hillary Clinton wins November's presidential election, Bill Clinton will be different from any previous "first spouses." And now, we might have some idea of what kind of role the former president would have in his wife's administration. "I was saying earlier in Louisville, where we had a big rally, my husband, who I'm going to put in charge of revitalizing the economy because, you know, he knows how to do it, especially in places like coal country and inner cities," Hillary Clinton said. Hillary Clinton made those comments at a rally in Kentucky over the weekend. While Bill's exact duties remain unclear at this point, this is the strongest hint Hillary has given about her husband's potential role thus far. 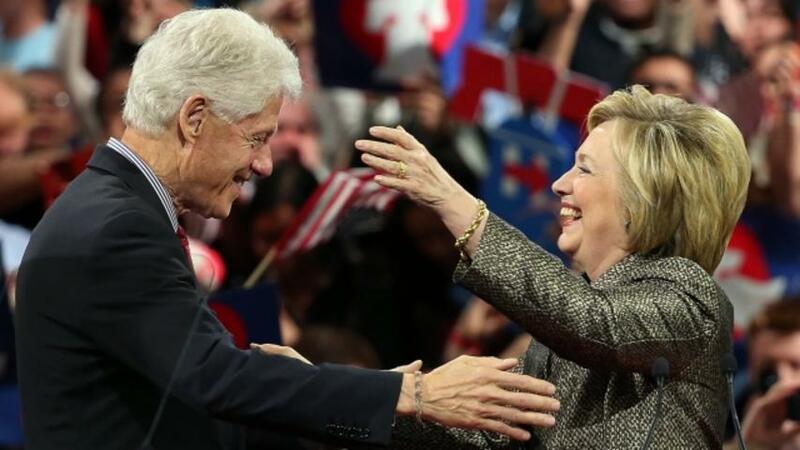 Bill Clinton, who served as president from 1993 to 2001, has long been credited by some for revitalizing the economy. He took office when the U.S. had the largest budget deficit in history ($290 billion) and left office with a surplus ($127 billion). In addition, 22.5 million new jobs were created while he was in the White House, and the unemployment rates dropped significantly under his administration. However, others have argued the 42nd president can't exactly take credit for all of the economic positivity. The economy was on the up-and-up when he took office, and the Republican-controlled Congress played a large role, some say. Bill Clinton has been hitting the campaign trail hard for his wife, but it hasn't come without a bit of controversy. Presumptive GOP presidential nominee Donald Trump has attacked Bill several times, and that's expected to continue should Hillary win the Democratic nomination.